The Woodworking Band Saw is typically the tool of choice when the woodworker needs to make accurate curved cuts in wood stock, no matter the thickness of the board. Band saws come in a variety of sizes, and band saw blades are available in a few different widths, depending on whether you need straighter or more tightly-curved cuts. Getting accurate results from a band saw can require some practice, and the tool often needs adjustments, particularly after a blade change. Learn how to get the most out of your band saw with these band saw tool tips. 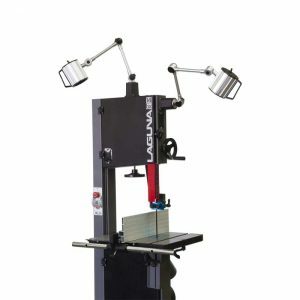 There are two main types of band saws, floor-standing cabinet models, and units that are shorter, for mounting either on a dedicated stand or on a bench top. Cabinet models are typically built for professional use, whereas the smaller units are better suited for the home-based woodworker. The cabinet models have more features and larger motors, and usually, feature a stronger frame which leads to more consistent cutting. The two main things to consider when choosing a band saw are the depth of cut and the throat. The saw’s depth of cut is the distance from the table to the upper blade guides. Many band saws are marketed on this feature alone, which tells the prospective buyer how thick of stock can be cut using the band saw. However, some saws that have only a six-inch depth of cut can have an optional riser added to the unit which extends the depth from six inches to twelve. This allows some less expensive saws to be able to cut thicker stock, particularly when resawing. The throat is the distance from the blade to the vertical frame section of the body of the saw. This distance determines the width of cut that can be completed on the band saw. 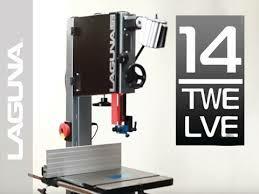 The throat on a free-standing cabinet band saw typically exceeds the 12 to 14-inch throat of smaller, bench-top models. Another consideration is the size of the band saw’s motor. Most home-level models incorporate a 3/4 to 1 horsepower motor, whereas professional models will have larger motors with variable speeds. For woodworkers, the variable speed won’t really matter, as slower than max speeds should be incorporated when cutting metals and some hard plastics. Every band saw should have a cast-iron, steel or aluminium alloy table which tilts up to 45-degrees for angled cuts. The table will typically be about 16-inches in both width and length, equipped with a miter track. Look for band wheels that have tires with cleaning brushes to keep the wheels clean. 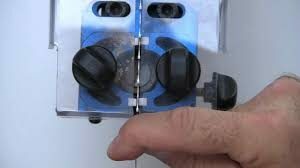 Look also for a unit with a built-in dust collection port, for connecting to your shop vacuum. Two very useful options that you should add to your band saw (if it doesn’t come already equipped) are a rip fence and a mitre gauge. These two add-ons will prove very useful when ripping, resawing and cross cutting. 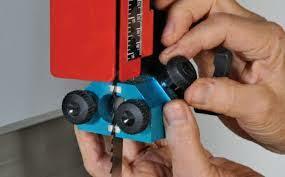 When setting up your band saw, read the instructions that accompany the unit very carefully. 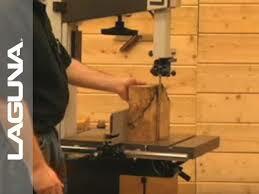 There are numerous fine adjustments which are necessary for the band saw to cut properly. Failure to follow these instructions, which include setting the blade tension and adjusting the blade guides, thrust bearing, and side bearings, will decrease the performance of the saw and make blades much more likely to break. Not only will the owner’s manual help you set up your saw properly, it will help you become much more familiar with the proper methods for safely cutting with your saw. A band saw is among the safest of power woodworking tools, but the saw is must be set up properly before use. A band saw is a fun tool to work with, but only if used correctly.